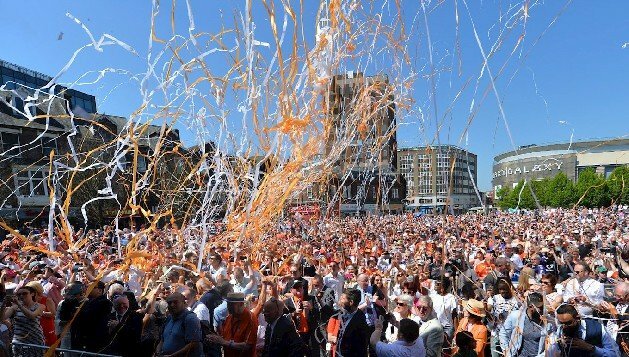 St George’s square in Luton town centre was a sea of orange and white on Sunday 6th May as part of the celebrations to mark the promotion of the club to league one. Supporters of the club filled the square as the team arrived in an open top bus to open the start of the celebrations. Musical entertainment and interviews with the team were followed by the official presentation of the trophy by the Mayor of Luton to manager Nathan Jones and team Captain Scott Cuthbert. This was our cue to fill the sky and stage with a web of orange and white streamers complimented by bursts of white vapour from our stage mounted CO2 jets. Using a combination of our Multishot Remote Control Streamer Cannons and Stadium Duo Streamer Cannons, we sent volleys of 10 meter long tissue streamers over 40 meters into the air which hung over the square before drifting back down to the fans below. Compact in size and with their wireless operation, our Multishot Remote Control Streamer Cannons can be positioned almost anywhere. Hidden away for a surprise moment or on the front of stage to shower a dancefloor, the electric cartridges can be custom filled with coloured confetti to fit in with any theme or colour scheme. For outdoor events, adding a final hit of large streamers with our huge Stadium Duo Cannons is the ultimate way to leave lasting impression on your audience.